For those of you who go to Starbucks or went to Starbucks probably know about their little devils known as Petite Vanilla Bean Scones. Yeah well I’m ashamed to admit it, but I loved those things. I used to eat those like mad and pretty often. Sadly they aren’t made with the best ingredients in the world and aren’t the healthiest but what if they were. Now that was something I had to investigate, I mean come on, how could you not take a look at one of those bad boys and want one. I rarely get cravings, but when I started thinking about these I could smell them already. I haven’t been thinking about baked goods or any treats lately until I started browsing some other recipes that were rather naughty. Initially my first thoughts were pretty sound and didn’t really initiate until I started thinking about those vanilla bean scones from Starbucks that were oh so irresistible. Now I don’t think anyone can say they haven’t ever gotten cravings, but I think I do well with dealing with them. Maybe a little too well, maybe to a point of obsession. Oh well, deliciousness done with healthy ingredients is an okay obsession in my book. Now, the idea behind these was to keep that wonderful buttery, crumbly scone texture but with that oh so comforting icing. The scones were relatively easy because of the way Almond flour works when you don’t use many eggs. It gets a very small rise, it’s fairly dense, and has a great velvety and buttery taste with that classic scone crumble. I wouldn’t be surprised if the dough part of this recipe had multiple uses apart from just doing scones. I thought of some pretty weird things I could do with it after I made these. Maybe I should save that for another time. I know, how suspenseful. Now, icing is very tricky without the use of sugar. Especially since it’s made with sugar. Impossible right? Wrong, cacao butter is the answer. A decadent, slightly sweet and incredibly flavored block of ivory colored heaven. Cacao butter was definitely my savior in this because I distinctly remember that cacao butter cools and hardens very quickly when added to something cold, and when it is hardened it has a similar texture and appearance to icing. The flavor is purely up to whatever you put in the cacao butter after it’s melted, in our case it was vanilla beans. Which not only makes it taste like vanilla bean which I would hope that it would, but it also accompanies the taste of pure cacao butter incredibly well. Even if your not into the whole healthy eating thing, don’t be dismayed by this because this brings raised eyebrows and wide eyes to just about anyone to anyone who takes a bite. In a good way of course. Don't be intimidated by the number of steps as this is incredibly easy to do and fairly quick. 2 packets of stevia or 2 tablespoons of honey warmed(I used pure stevia packets without any additives because this works better with a solid or dry sweetness going into it so the cacao butter doesn't seize up, but if you do use honey just make sure it's warmed and you add it in slowly while mixing the melted cacao). In a small bowl mix 1 egg, stevia or honey, lemon juice, and vanilla extract and whisk until combined. Flatten dough out onto parchment lined baking sheet and shape into a rectangle shape about 7-8 inches long and 4 inches wide. Cut the dough with a knife long enough to cut it all the way through width wise. Cut it into 3 even sections width wise by pressing your knife through the dough do not slice it and do not pull them apart just slowly lift your knife back out so that they lay gently next to each other. Then cut horizontally, the same way you did last time, all the way across to cut the entire thing in half. This should leave you with 6 even squares. diagonally but not all the way across the rectangle just stick to 2 out of the 3 sections so that you are cutting one of the four squares diagonally and repeat in both directions this is just and easy way to keep you from having to cut each individual square diagonally. 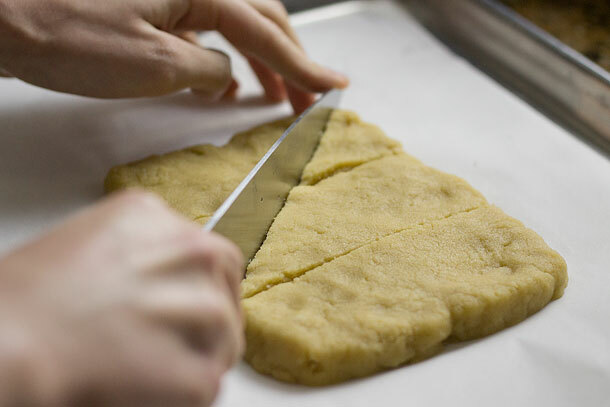 You should have 2 more whole squares remaining on one of the edges, simply cut each of those diagonally across once and you should be left with 12 total mini scones. Once scones are done pull them out and let them cool slightly for about 10 minutes before breaking them apart and then placing them on a cooling rack for 10 more minutes. Once they are no longer warm place them on back on the baking sheet and into the refrigerator to get cold for about 10-20 minutes. Once cold leave them in the refrigerator and begin making your icing by melting your cacao butter in the microwave. Microwave for 20 seconds and then stir to disperse the heat and keep heating and stirring at 10 second intervals until all of the cacao butter is melted. Once it is melted add stevia or warmed honey and scraped vanilla bean pod individually and while continuously stirring until combined thorougly. The cacao butter mixture should begin to solidify very quickly so pour gently and slowly but move quickly and make sure to keep the mixture stirred so the vanilla bean seeds stay thoroughly incorporated and don't sink to the bottom. Once all of them are iced you can leave them out at room temperature for about 2-3 days or refrigerate them for up to 2 weeks. 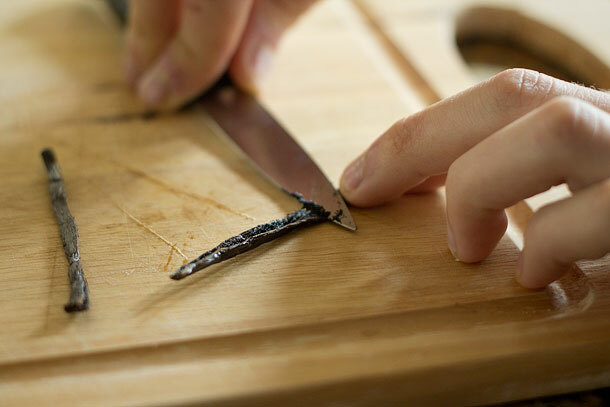 As stated before you do not want to pull these apart after you press your knife through the dough just let them fall gently next to each other as you slowly pull your knife out. You can look at the photo of me cutting it in the post as a reference. Oh, man! These look amazing, like everything else I’ve seen here!! Now I am craving these, and I’ve never even been to Starbucks! (yeah, really! 100% true) But they look so good!! Thank you for sharing the recipe!! I was just thinking, I bet if you added the cocoa butter while the scones were hot, and it soaked in a bit…they would be pretty awesome as well!! I bet that would be tasty but don’t recommend it for this recipe. It’s better to have a nice layer of delicious cacao butter and vanilla bean to bite into. Okay, these look incredible! Loving that cacao butter frosting, it sounds divine!!! Just discovered you through the Kitchn and think you are awesome! Ooh, I’ve been craving something sort of like this. I never had the Sbux version, but I’m sure yours are waaaaay better! I wish I would have had a few of these for breakfast! Lovely! These look delicious! I have a weakness for scones, so I can’t wait to try them. Whole vanilla bean so great! Found your blog via The Kitchn – congratulations on being featured there! curious, what brand of cocoa butter do you use? i’ve been on the hunt for some for a while but don’t want to get the wrong kind since there is so much available for cosmetic use. none of my local health food stores carry it so i’ll have to order online. as soon as i get the cocoa butter squared away i will make these!! Looks great,Josh! 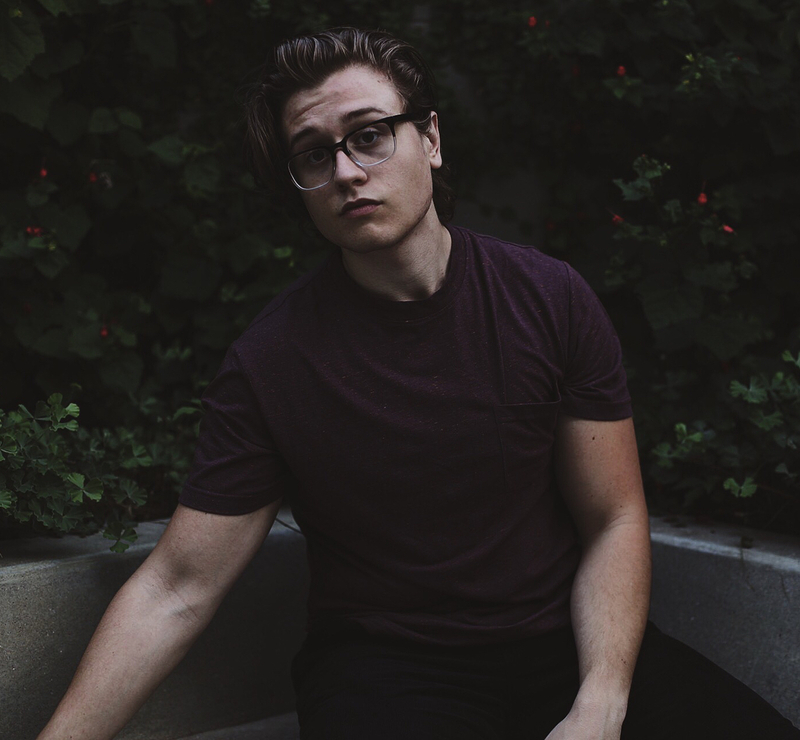 Kudos to you for being so creative & for being such a strong advocate for healthy eating. The cacao butter icing is genius! These look really delicious ….but if you are into a healthy way of life ….why the microwave??? I don’t see how it’s necessarily unhealthy, the cacao butters temperature doesn’t rise any higher than about 110-118 degrees when doing this in intervals and then diffusing the heat by stirring in between each interval so there is no way it’s oxidizing if that’s what you’re concerned about, and I doubt very many nutrients are lost at 118 degrees, not to mention this may be healthy but it’s still a treat, just a much healthier one. It’s better than a sugar laden brick of tar that most stores sell that we most commonly call candy. And the use of the microwave is because it’s a really easy way to temper the cacao butter without a double boiler and thermometer because I assumed that not very many people had those lying around so you get a smooth topping without any streaks. As said before this is still a “treat” even if it is a healthy one, and should be enjoyed in moderation just as anything else and the only reason is because of the density of nuts in it. Hope this clears things up. Super recipe! And thanks for sharing. With regard to microwaves it is neither the the temperature nor oxidation that is the issue, but that food molecules are “fractured” in the process and our bodies do not process fractured jagged molecules. The body responds to this as an inflammatory. I cannot urge you enough to do your homework on microwaves. Thank you so much for your sweet words and concern for my safety. My friend with a PhD in medical biophysics has researched this and assured me that there are no health concerns from microwaving food. Also I have read several articles contradicting the “fractured jagged molecules”. But if you don’t want to use a microwave then you can use a double boiler. I have an egg allergy… Do you know which egg substitute would be appropriate for this recipie? First time on your site–your recipes are outRAGEOUS! 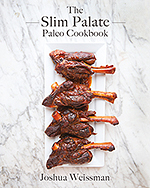 some of the best in the paleo-sphere. i’m not even the type to comment, but I had to let ya know! keep ’em comin. Thanks Sally, let me know if you try them because they are a great after dinner treat. Also, take pics if you do and send them my way. I used to LOVE these at Starbucks. I am so happy you have made this recipe! I can’t wait to try them as a treat! First of all, you have a really great blog I discovered just the other day and an inspiring story. Regarding your recipes they all look so great that I decided to recook (hopefully) all of them as we seem to share a similar taste. This one, I made yesterday and sadly I didn’t quite get the results you did. First of all, I am from Germany and and here you can get what I would translate as ground almonds which is a different product than what I would translate to almond flour. The latter is partly de-oiled and thus a little dryer. The former is just blanched almonds finely ground. What did you use? For my results the dough was fine (I used about 50g of Erythrit as sweetener), a little sticky maybe. And still quite soft after cooling. The icing however did not work as I expected. I warmed honey and melted the cocoa butter using a double boiler. First of all the honey and cocoa butter did not combine very well and was very fluid when putting the mixture over the cold scones. I then put the scones into the fridge but had to wait more than 30 minutes until the cocoa butter soldified. Maybe it was still too hot when I poured it over the scones. 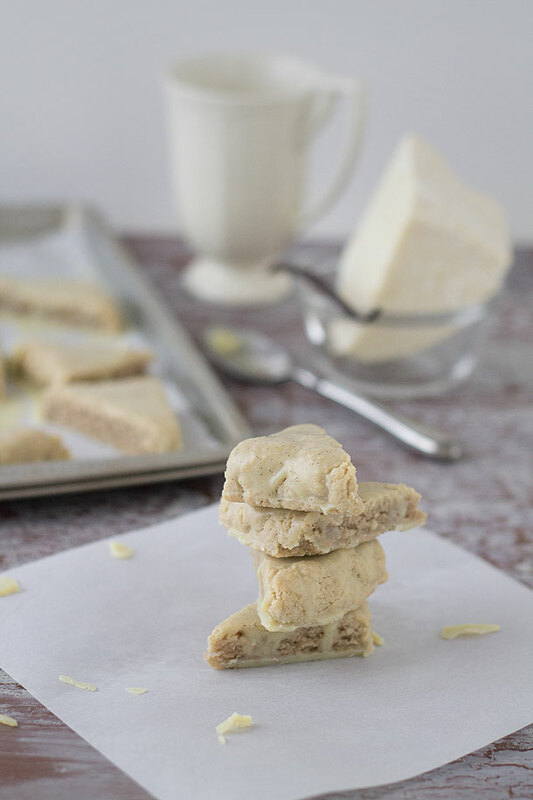 Next time, I think I’ll try to add some Coconut Milk Powder to the mixture, which will cool it down and might give it a little “thicker” texture (recipe for paleo white chocolate: http://civilizedcavemancooking.com/grain-free-goodies/paleo-white-chocolate/). Anyways, great recipe, and keep up the good work. Hi Nicolas, if you look on the recipe I have a clickable link to the brand of almond flour that I used. 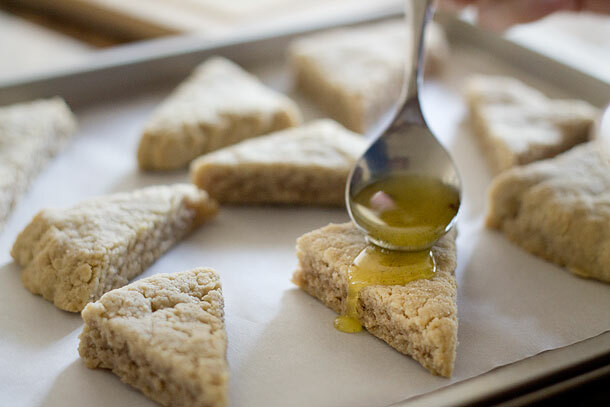 I really cannot vouch for any texture problems you could have had with the scones because you used almond meal and erythritol which neither I used or have tried and would drastically change the texture by using those. As for the icing not working for you I really don’t know what could have gone wrong. If you put it on as they were ice cold then it should have solidified most of the way almost immediately and then you just let it set in the fridge. Lastly in regards to the scones you linked that you expected these to be like I see where you are coming from, and I agree those are traditional scones. 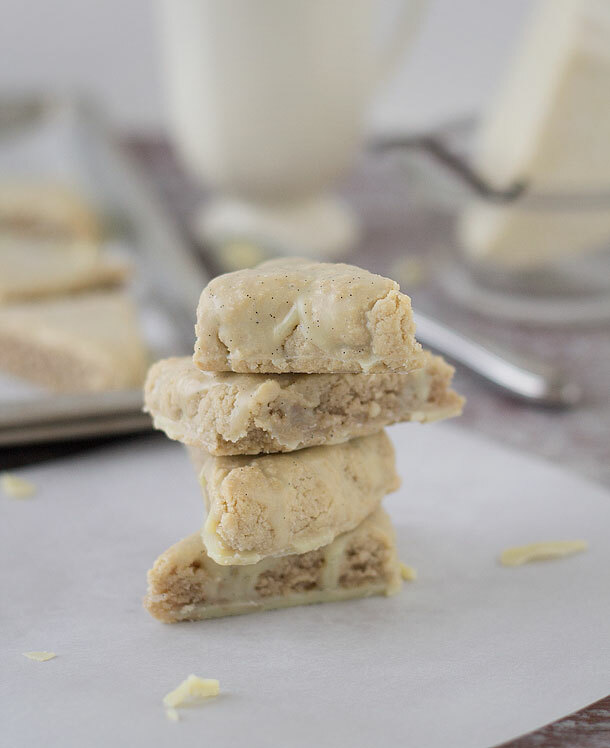 But I had already mentioned previously that these are not traditional scones they are more like a copycat recipe of the Starbucks Vanilla Bean Scones. Sorry to find out you had such a difficult time with these. Hello, my family and I just started doing the paleo diet, and my 5 year old sons absolute favorite treat in the world was petite vanilla scones from Starbucks. I am so excited to try this recipe. I was wondering if you thought these would freeze well? I am hoping to make a large batch and be able to pull one or two out at a time for a small occasional treat. That’s a great question Trisha, thanks. Yes they should freeze just fine. I refrigerated mine for quite a while and they held together wonderfully. I hope you enjoy the recipe, and send in some pics if you get the chance. The instructions about cutting in 6,7 and 8 confuse me. If I made a 6 x 4 rectangle and cut across it twice to make three 2 x 4 rectangles it would look a bit like the picture. Section 7 seems to need correcting – it doesn’t make sense. Help ! Nothing works quite like the cocoa butter I’m afraid. Hi- just wondering. I know this is a little late in the game here (older post), but I’m wondering if there are vast differences among cocoa butters. 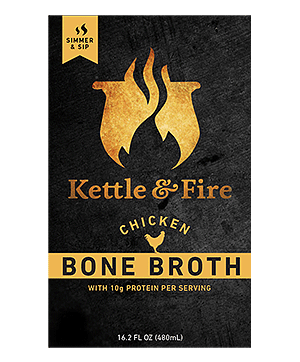 I bought some with my bulletproof coffee from the bulletproof guy, and it pretty much tasted (plain, right out of the bag) like a crayon. Is that normal? Your recipe looks amazing, but I’m hesitant to ruin it with the cocoa butter that I have on hand. Heard you on Abel’s podcast. Fantastic interview, you’re an inspiration. Both your cooking and photography are exceptional – looking forward to your cookbook. The cocoa butter should taste fairly plain that’s why in this recipe it has vanilla bean and a sweetener in it to flavor it. Just made these, followed the directions exactly. Only glitch was that the icing did not harden very quickly, but I think maybe it was too hot when I added to the scones. Regardless, amazing recipe. Five stars. Your innovation with the cacao butter is truly remarkable. I love how you think outside of the box and come up with amazingly basic but delicious substitute solutions. I can’t wait to try these. BTW, made your chocolate chip cookies for Easter — outstanding! and I think even better the next day (if that’s even possible). Can’t wait to see if you can come up with some magic with key limes, like key lime pie! You’re truly a culinary genius Josh! I am so going to make these, so delicious and healthy, Thanks for sharing!